leko keeps us in stitches on a daily basis. a few days ago, i had the door to the linen closet open because i was getting a few things out of there. i walked away for a second and when i came back i found leko in the closet pulling a fleece blanket out of the closet with his teeth. ryan and i stood there in amazement watching leko pull this blanket out of the closet and onto the floor. i guess he must have been cold or something. we didn't have the heart to put the blanket back in the closet after he went through all of the effort of pulling it out, so we put it on our bed for him to enjoy. he has been sleeping on it every single day since. leko loves to cuddle, and we have no complaints about that! he is such a little lover. on sunday i found leko on top of ryan in bed mid-afternoon. he looked cold, so we covered him with his blue blanket that he has been loving all week. 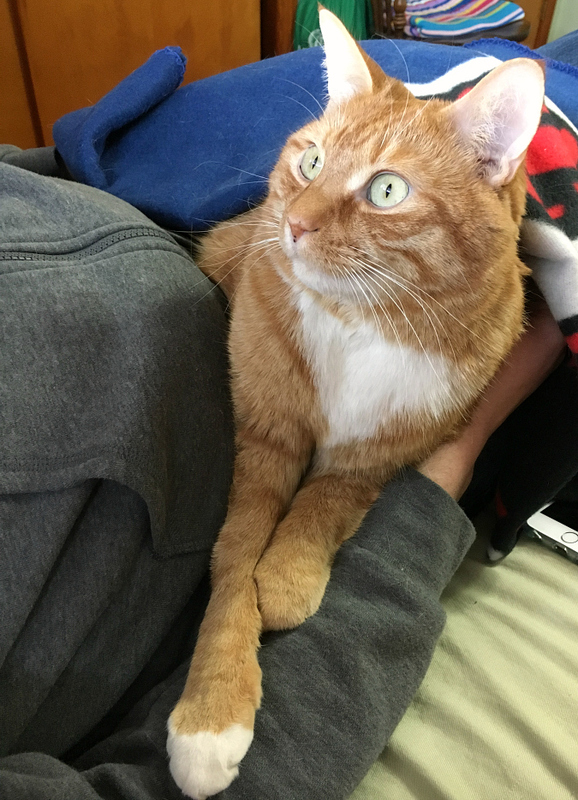 he was in kitten heaven as he sat on ryan's lap, covered with his blanket, looking out the window at the birdies. i had to grab a photo of the moment on my phone. later in the day, leko dug himself a spot under his blanket to make himself a little tent. 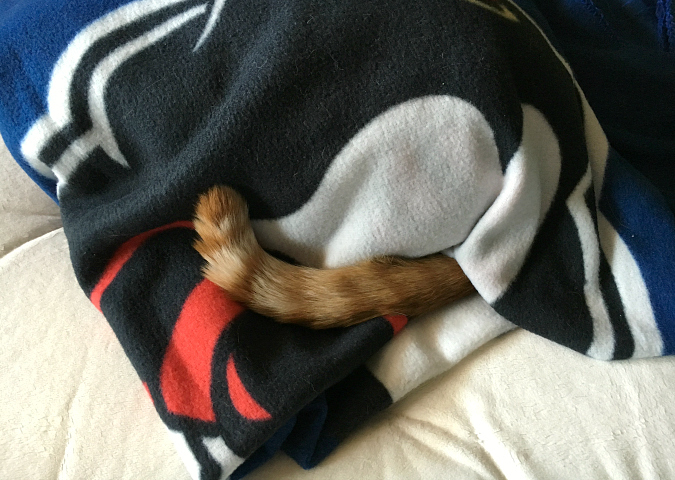 when we went to check on him, we found that he had all of his body covered by the blanket except for his tail. oh my goodness, we couldn't stop laughing. it was just too cute! did you know that yesterday was national pet day?! we celebrated last night by curling up on the couch with leko to watch dancing with the stars which is leko's favorite show. 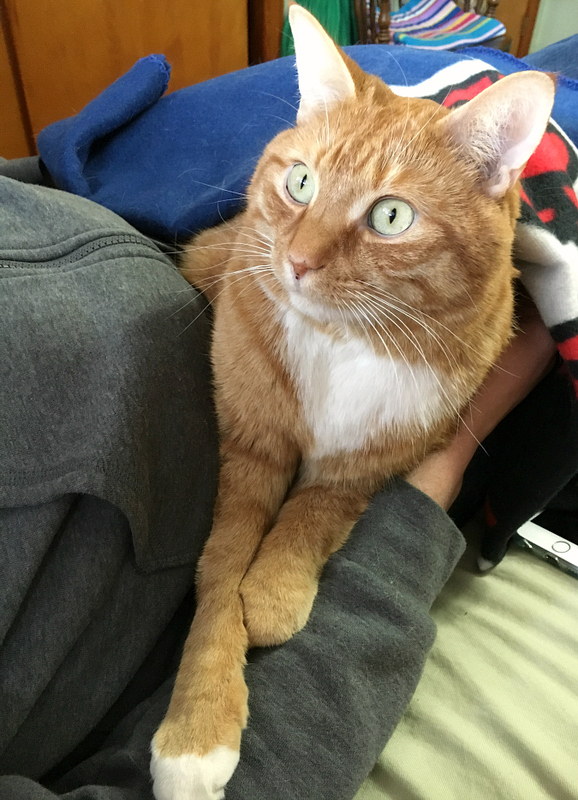 leko just loves sitting on our laps while we watch tv or movies either on the couch or in bed. he was really excited when he heard that illumination entertainment and universal pictures have a new movie coming out this july called the secret life of pets. it's an animated comedy about the lives our pets lead after we leave for work or school each day. purrfect! all three of us look forward to renting it and watching it together at home when it comes out on dvd. Leko is just such a cutie; he always makes me smile!!! I love the tail hanging out. You can't see me because I can't see you. The tail belongs to someone else. Lounging with Leko seems like a good idea. Tell him I am on my way up.